Replica of Tyrannosaurus rex at the Senckenberg Museum. Dinosaurs were vertebrate animals that dominated terrestrial ecosystems for over 160 million years, first appearing approximately 230 million years ago. At the end of the Cretaceous Period, 65 million years ago, dinosaurs experienced a catastrophic extinction, which ended their dominance on land. Taxonomists consider modern birds to be the direct descendants of theropod dinosaurs. Since the first dinosaur was recognized in the 19th century, mounted, fossilized dinosaur skeletons have become major attractions at museums around the world. 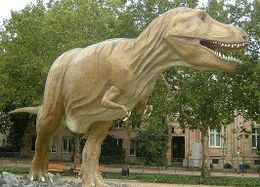 Dinosaurs have become a part of world culture and remain consistently popular among children and adults alike. They have been featured in best-selling books and films such as Jurassic Park, and new discoveries are regularly covered by the media. The term dinosaur is sometimes used informally to describe other prehistoric reptiles, such as the pelycosaur Dimetrodon, the winged pterosaurs and the aquatic ichthyosaurs, plesiosaurs and mosasaurs, although technically none of these were dinosaurs. 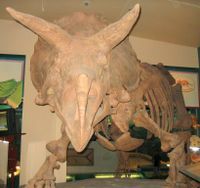 Triceratops skeleton at the Smithsonian National Museum of Natural History. The taxon Dinosauria was formally named by the English palaeontologist Richard Owen in 1842 as "a distinct tribe or suborder of Saurian reptiles". The term is derived from the Greek words δεινός (deinos meaning "terrible", "fearsome" or "formidable") and σαύρα (saura meaning "lizard" or "reptile"). Owen chose it to express his awe at the size and majesty of the extinct animals, not out of fear or trepidation at their size and often-formidable arsenal of teeth and claws. Dinosaurs were an extremely varied group of animals; according to a 2006 study, 527 dinosaur genera have been identified with certainty so far, and 1,844 genera are believed to have existed. Some were herbivorous, others carnivorous. Some dinosaurs were bipeds, some were quadrupeds, and others, such as Ammosaurus and Iguanodon, could walk just as easily on two or four legs. Regardless of body type, nearly all known dinosaurs were well-adapted for a predominantly terrestrial, rather than aquatic or aerial, habitat. All dinosaurs so far discovered share certain modifications to the ancestral archosaurian skeleton. Although some later groups of dinosaurs featured further modified versions of these traits, they are considered typical across Dinosauria; the earliest dinosaurs had them and passed them on to all their descendants. Such common structures across a taxonomic group are called synapomorphies. Dinosaur synapomorphies include: reduced fourth and fifth digits on the manus ('hand'), reduced number of digits on the pes (foot) to three main toes, a sacrum (the region of the vertebral column to which the pelvis attaches, composed of three or more fused vertebrae) and an open or perforate acetabulum (hip socket with a hole at its centre). Dinosaurs are unique among all tetrapods in having this perforate acetabulum. Scientists generally agree that a variety of other anatomical features were shared by most dinosaurs. These include forelimbs shorter and lighter than hind limbs, an unusual secondary palate that permitted dinosaurs to eat and breathe simultaneously, a relatively straight femur with medially-directed femoral head, two pairs of holes in the temporal region of the skull (i.e. a diapsid skull), rearward-pointing elbows in the front limbs and forward-pointing knees in the hind limbs. The hip joint arrangement described above allowed an erect stance, in which hind limbs were situated directly beneath the body or 'underslung'. This stance is like that of most mammals today but unlike that of other reptiles, which have a less erect posture and limbs splayed out to either side. The vertical action of the limbs in dinosaurs allowed for more efficient and faster locomotion, compared to the clumsier and slower movement of other 'sprawled' reptiles. It also allowed many types of dinosaurs to become bipedal. 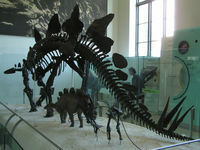 Stegosaurus skeleton at the American Museum of Natural History in New York City. Under phylogenetic taxonomy, dinosaurs are defined as all descendants of the most recent common ancestor of Triceratops and modern birds. They are divided into Ornithischia (bird-hipped) and Saurischia (lizard-hipped), depending upon pelvic structure. Ornithischian dinosaurs had a four-pronged pelvic configuration, incorporating a caudally-directed (rear-pointing) pubis bone with (most commonly) a forward-pointing process. By contrast, the pelvic structure of saurischian dinosaurs was three-pronged, and featured a pubis bone directed cranially, or forwards, only. Ornithischia includes all taxa sharing a more recent common ancestor with Triceratops than with Saurischia, while Saurischia includes those taxa sharing a more recent common ancestor with birds than with Ornithischia. It has also been suggested that Dinosauria be defined as all the descendants of the most recent common ancestor of Megalosaurus and Iguanodon, because these were two of the three genera cited by Richard Owen when he recognized the Dinosauria. There is an almost universal consensus among paleontologists that birds are the descendants of theropod dinosaurs. Using the strict cladistical definition that all descendants of a single common ancestor are related, modern birds are dinosaurs and dinosaurs are, therefore, not extinct. Modern birds are classified by most paleontologists as belonging to the subgroup Maniraptora, which are coelurosaurs, which are theropods, which are saurischians, which are dinosaurs. However, referring to birds as 'avian dinosaurs' and to all other dinosaurs as 'non-avian dinosaurs' is cumbersome. Birds are still referred to as birds, at least in popular usage and among ornithologists. It is also technically correct to refer to birds as a distinct group under the older Linnaean classification system, which accepts paraphyletic taxa that exclude some descendants of a single common ancestor. Paleontologists mostly use cladistics, which classifies birds as dinosaurs, but some biologists of the older generation do not. For clarity, this article will use 'dinosaur' as a synonym for 'non-avian dinosaur', and 'bird' as a synonym for 'avian dinosaur' (meaning any animal that evolved from the common ancestor of Archaeopteryx and modern birds). The term 'non-avian dinosaur' will be used for emphasis as needed. It should be noted that this article's definition of 'bird' differs from the definition common in everyday language; to most non-scientists, a 'bird' is simply a two-legged animal with wings and feathers. While the evidence is incomplete, it is clear that, as a group, dinosaurs were large. Even by dinosaur standards, the sauropods were gigantic. For much of the dinosaur era, the smallest sauropods were larger than anything else in their habitat, and the largest were an order of magnitude more massive than anything else that has since walked the Earth. Giant prehistoric mammals such as the Indricotherium and the Columbian mammoth were dwarfed by the giant sauropods, and only a handful of modern aquatic animals approach or surpass them in size — most notably the blue whale, which reaches up to 190,000 kg (209 tons) and 33.5 m (110 ft) in length. Most dinosaurs, however, were much smaller than the giant sauropods. Current evidence suggests that dinosaur average size varied through the Triassic, early Jurassic, late Jurassic and Cretaceous periods. According to paleontologist Bill Erickson, estimates of median dinosaur weight range from 500 kg to 5 tonnes; a recent study of 63 dinosaur genera yielded an average weight greater than 850 kg — comparable to the weight of a grizzly bear — and a median weight of nearly 2 tons, or about as much as a giraffe. This contrasts sharply with the size of modern mammals; on average, mammals weigh only 863 grams, or about as much as a large rodent. The smallest dinosaur was bigger than two-thirds of all current mammals; the majority of dinosaurs were bigger than all but 2% of living mammals. 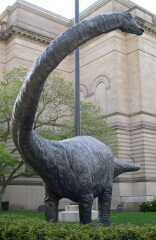 A statue of Diplodocus carnegiei, outside the Carnegie Museum of Natural History. Size of a human compared to a Tyrannosaurus rex. The tallest and heaviest dinosaur known from a complete skeleton is the Brachiosaurus specimen that was discovered in Tanzania between 1907–12. It is now mounted and on display at the Humboldt Museum of Berlin and is 12 m (38 ft) tall and probably weighed between 30,000–60,000 kg (33–66 short tons). The longest complete dinosaur is the 27 m (89 ft) long Diplodocus, which was discovered in Wyoming in the United States and displayed in Pittsburgh's Carnegie Natural History Museum in 1907. There were larger dinosaurs, but knowledge of them is based entirely on a small number of incomplete fossil samples. The largest herbivorous specimens on record were all discovered in the 1970s or later, and include the massive Argentinosaurus, which may have weighed 80,000–100,000 kg (88–121 tons); the longest, the 40 m (130 ft) long Supersaurus; and the tallest, the 18 m (60 ft) Sauroposeidon, which could have reached a sixth-floor window. The largest known carnivorous dinosaur was Spinosaurus, reaching a length of 16-18 meters (53-60 ft), and weighing in at 9 tons. Other large meat-eaters included Giganotosaurus, Mapusaurus, Tyrannosaurus rex and Carcharodontosaurus. Not including modern birds like the bee hummingbird, the smallest dinosaurs known were about the size of a crow or a chicken. The theropods Microraptor, Parvicursor, and Saltopus were all under 60 cm (2 ft) in length. Interpretations of dinosaur behaviour are generally based on the pose of body fossils and their habitat, computer simulations of their biomechanics, and comparisons with modern animals in similar ecological niches. As such, the current understanding of dinosaur behaviour relies on speculation, and will likely remain controversial for the foreseeable future. However, there is general agreement that some behaviors which are common in crocodiles and birds, dinosaurs' closest living relatives, were also common among dinosaurs. The first perceived direct evidence of herding behaviour was the 1878 discovery of 31 Iguanodon dinosaurs which were thought to have perished together in Bernissart, Belgium, after they fell into a deep, flooded sinkhole and drowned. Despite the deposition of those skeletons being now regarded as more gradual, other, well supported, mass death sites were subsequently discovered. Those, along with multiple trackways, suggest that herd or pack behaviour was common in many dinosaur species. Trackways of hundreds or even thousands of herbivores indicate that duck-bills (hadrosaurids) may have moved in great herds, like the American Bison or the African Springbok. Sauropod tracks document that these animals traveled in groups composed of several different species, at least in Oxford, England, and others kept their young in the middle of the herd for defense according to trackways at Davenport Ranch, Texas. Dinosaurs may have congregated in herds for defense, for migratory purposes, or to provide protection for their young. Jack Horner's 1978 discovery of a Maiasaura ("good mother dinosaur") nesting ground in Montana demonstrated that parental care continued long after birth among the ornithopods. There is also evidence that other Cretaceous-era dinosaurs, like the Patagonian sauropod Saltasaurus (1997 discovery), had similar nesting behaviors, and that the animals congregated in huge nesting colonies like those of penguins. The Mongolian maniraptoran Oviraptor was discovered in a chicken-like brooding position in 1993, which may mean it was covered with an insulating layer of feathers that kept the eggs warm. Trackways have also confirmed parental behaviour among sauropods and ornithopods from the Isle of Skye in northwestern Scotland. Nests and eggs have been found for most major groups of dinosaurs, and it appears likely that dinosaurs communicated with their young, in a manner similar to modern birds and crocodiles. The crests and frills of some dinosaurs, like the marginocephalians, theropods and lambeosaurines, may have been too fragile to be used for active defense, so they were likely used for sexual or aggressive displays, though little is known about dinosaur mating and territorialism. The nature of dinosaur communication also remains enigmatic, and is an active area of research. For example, recent evidence suggests that the hollow crests of the lambeosaurines may have functioned as resonance chambers used for a wide range of vocalizations. From a behavioural standpoint, one of the most valuable dinosaur fossils was discovered in the Gobi Desert in 1971. It included a Velociraptor attacking a Protoceratops, proving that dinosaurs did indeed attack and eat each other. While cannibalistic behaviour among theropods is no surprise, this too was confirmed by tooth marks from Madagascar in 2003. There seem to have been no burrowing species of dinosaur and few climbing species. This is somewhat surprising when compared to the later mammalian radiation in the Cenozoic, which included many species of these types. As to how the animals moved, biomechanics has provided significant insight. For example, studies of the forces exerted by muscles and gravity on dinosaurs' skeletal structure have demonstrated how fast dinosaurs could run, whether diplodocids could create sonic booms via whip-like tail snapping, whether giant theropods had to slow down when rushing for food to avoid fatal injuries, and if sauropods could float. A reconstruction of Eoraptor, an early dinosaur. Dinosaurs diverged from their archosaur ancestors approximately 230 million years ago during the Middle to Late Triassic period, roughly 20 million years after the Permian-Triassic extinction event wiped out an estimated 95% of all life on Earth. Radiometric dating of fossils from the early dinosaur genus Eoraptor establishes its presence in the fossil record at this time. Paleontologists believe Eoraptor resembles the common ancestor of all dinosaurs; if this is true, its traits suggest that the first dinosaurs were small, bipedal predators. Such a notion is corroborated by the more primitive dinosaur-like ornithodirans hailing from Middle Triassic strata of Argentina such as Marasuchus and Lagerpeton, which were also small bipedal, perhaps leaping, predators. The first few lines of primitive dinosaurs diversified rapidly through the rest of the Triassic period; dinosaur species quickly evolved the specialized features and range of sizes needed to exploit nearly every terrestrial ecological niche. During the period of dinosaur predominance, which encompassed the ensuing Jurassic and Cretaceous periods, nearly every known land animal larger than 1 meter in length was a dinosaur. Knowledge about dinosaurs is derived from a variety of fossil and non-fossil records, including fossilized bones, feces, trackways, gastroliths, feathers, impressions of skin, internal organs and soft tissues. Many fields of study contribute to our understanding of dinosaurs, including physics, chemistry, biology, and the earth sciences (of which paleontology is a sub-discipline). Dinosaur remains have been found on every continent on Earth, including Antarctica. 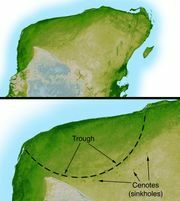 Numerous fossils of the same dinosaur species have been found on completely different continents, corroborating the generally-accepted theory that all land masses were at one time connected in a super-continent called Pangaea. Pangaea began to break apart during the Triassic period roughly 230 million years ago. The field of dinosaur research has enjoyed a surge in activity that began in the 1970s and is ongoing. This was triggered, in part, by John Ostrom's discovery of Deinonychus, an active, vicious predator that may have been warm-blooded, in marked contrast to the prevailing image of dinosaurs as sluggish and cold-blooded. Vertebrate paleontology, arguably the primary scientific discipline involved in dinosaur research, has become a global science. Major new dinosaur discoveries have been made by paleontologists working in previously unexploited regions, including India, South America, Madagascar, Antarctica, and most significantly in China (the amazingly well-preserved feathered dinosaurs in China have further consolidated the link between dinosaurs and their conjectured living descendants, modern birds). The widespread application of cladistics, which rigorously analyzes the relationships between biological organisms, has also proved tremendously useful in classifying dinosaurs. Cladistic analysis, among other modern techniques, helps to compensate for an often incomplete and fragmentary fossil record. Dinosaurs (including birds) are archosaurs, like modern crocodilians. Archosaurs' diapsid skulls have two holes located where the jaw muscles attach, called temporal fenestrae. Most reptiles (including birds) are diapsids; mammals, with only one temporal fenestra, are called synapsids; and turtles, with no temporal fenestra, are anapsids. Anatomically, dinosaurs share many other archosaur characteristics, including teeth that grow from sockets rather than as direct extensions of the jawbones. Within the archosaur group, dinosaurs are differentiated most noticeably by their gait. Dinosaur legs extend directly beneath the body, whereas the legs of lizards and crocodylians sprawl out to either side. All dinosaurs were land animals. Many other types of reptiles lived at the same time as the dinosaurs. Some of these are commonly, but incorrectly, thought of as dinosaurs, including plesiosaurs (which are not closely related to the dinosaurs) and pterosaurs, which developed separately from reptilian ancestors in the late Triassic period. The following is a simplified classification of dinosaur families. A more detailed version can be found at List of dinosaur classifications. The dagger (†) is used to indicate taxa that are extinct. Dinosaur models at the Royal Ontario Museum. Modern evidence indicates that dinosaurs thrived in cooler temperate climates, and that at least some dinosaur species must have regulated their body temperature by internal biological means (perhaps aided by the animals' bulk). Evidence of endothermism in dinosaurs includes the discovery of polar dinosaurs in Australia and Antarctica (where they would have experienced a cold, dark six-month winter), the discovery of dinosaurs whose feathers may have provided regulatory insulation, and analysis of blood-vessel structures that are typical of endotherms within dinosaur bone. Skeletal structures suggest that theropods and other dinosaurs had active lifestyles better suited to an endothermic cardiovascular system, while sauropods exhibit fewer endothermic characteristics. It is certainly possible that some dinosaurs were endothermic while others were not. Scientific debate over the specifics continues. Complicating the debate is the fact that warm-bloodedness can emerge based on more than one mechanism. Most discussions of dinosaur endothermy tend to compare them to average birds or mammals, which expend energy to elevate body temperature above that of the environment. Small birds and mammals also possess insulation, such as fat, fur, or feathers, which slows down heat loss. However, large mammals, such as elephants, face a different problem because of their relatively small ratio of surface area to volume ( Haldane's principle). This ratio compares the volume of an animal with the area of its skin: as an animal gets bigger, its surface area increases more slowly than its volume. At a certain point, the amount of heat radiated away through the skin drops below the amount of heat produced inside the body, forcing animals to use additional methods to avoid overheating. In the case of elephants, they are hairless, and have large ears which increase their surface area, and have behavioural adaptations as well (such as using the trunk to spray water on themselves and mud wallowing). These behaviors increase cooling through evaporation. Large dinosaurs would presumably have had to deal with similar issues; their body size suggest they lost heat relatively slowly to the surrounding air, and so could have been what are called inertial homeotherms, animals that are warmer than their environments through sheer size rather than through special adaptations like those of birds or mammals. However, so far this theory fails to account for the vast number of dog- and goat-sized dinosaur species which made up the bulk of the ecosystem during the Mesozoic period. Birds and non-avian dinosaurs share many features. Birds share over a hundred distinct anatomical features with theropod dinosaurs, which are generally accepted to have been their closest ancient relatives. 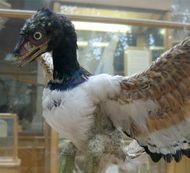 A model of Archaeopteryx lithographica on display at the Oxford University Museum of Natural History. Archaeopteryx, the first good example of a "feathered dinosaur", was discovered in 1861. The initial specimen was found in the Solnhofen limestone in southern Germany, which is a lagerstätte, a rare and remarkable geological formation known for its superbly detailed fossils. Archaeopteryx is a transitional fossil, with features clearly intermediate between those of modern reptiles and birds. Brought to light just two years after Darwin's seminal The Origin of Species, its discovery spurred the nascent debate between proponents of evolutionary biology and creationism. This early bird is so dinosaur-like that, without a clear impression of feathers in the surrounding rock, specimens are commonly mistaken for Compsognathus. Since the 1990s, a number of additional feathered dinosaurs have been found, providing even stronger evidence of the close relationship between dinosaurs and modern birds. Most of these specimens were unearthed in the Liaoning province in northeastern China, which was part of an island continent during the Cretaceous period. Though feathers have been found only in the lagerstätte of the Yixian Formation and a few other places, it is possible that non-avian dinosaurs elsewhere in the world were also feathered. The lack of widespread fossil evidence for feathered non-avian dinosaurs may be due to the fact that delicate features like skin and feathers are not often preserved by fossilization and thus are absent from the fossil record. Tyrannosaurus rex skeleton at the Field Museum of Natural History. Comparison of bird and dinosaur skeletons, as well as cladistic analysis, strengthens the case for the link, particularly for a branch of theropods called maniraptors. Skeletal similarities include the neck, pubis, wrist (semi-lunate carpal), arm and pectoral girdle, shoulder blade, clavicle and breast bone. Euoplocephalus was a typical "armored dinosaur" of the Ankylosauria superfamily. 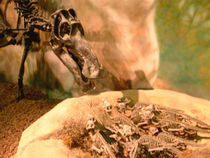 A dinosaur embryo was found without teeth, suggesting that some parental care was required to feed the young dinosaur. It is also possible that the adult dinosaurs regurgitated into a young dinosaur's mouth to provide sustenance, a behaviour that is also characteristic of numerous modern bird species. Large meat-eating dinosaurs had a complex system of air sacs similar to those found in modern birds, according to an investigation which was led by Patrick O'Connor of Ohio University. The lungs of theropod dinosaurs (carnivores that walked on two legs and had birdlike feet) likely pumped air into hollow sacs in their skeletons, as is the case in birds. "What was once formally considered unique to birds was present in some form in the ancestors of birds", O'Connor said. The study was funded in part by the National Science Foundation. Modern computerized tomography (CT) scans of dinosaur chest cavities (conducted in 2000) found the apparent remnants of complex four-chambered hearts, much like those found in today's mammals and birds. A recently discovered troodont fossil demonstrates that the dinosaurs slept like certain modern birds, with their heads tucked under their arms. This behaviour, which may have helped to keep the head warm, is also characteristic of modern birds. Another piece of evidence that birds and dinosaurs are closely related is the use of gizzard stones. These stones are swallowed by animals to aid digestion and break down food and hard fibres once they enter the stomach. When found in association with fossils, gizzard stones are called gastroliths. Because a particular stone could have been swallowed at one location before being carried to another during migration, paleontologists sometimes use the stones found in dinosaur stomachs to establish possible migration routes. In 2002, paleontologists Zielinski and Budahn reported the discovery of a single hadrosaur leg bone fossil in the San Juan Basin, New Mexico. The formation in which the bone was discovered has been dated to the early Paleocene epoch approximately 64.5 million years ago. If the bone was not re-deposited into that stratum by weathering action, it would provide evidence that some dinosaur populations may have survived at least a half million years into the Cenozoic Era. A worker on scaffolding services the head of a full-size animatronic model of Tyrannosaurus rex. There has been much speculation about the use of technology to bring dinosaurs back to life. In Michael Crichton's book Jurassic Park (later adapted into a movie), which popularized the idea, scientists use blood from fossilized mosquitos that have been suspended in tree sap since the Mesozoic to reconstruct the DNA of dinosaurs, filling chromosomal gaps with modern frog genes. It is probably impossible to resurrect dinosaurs in this manner. One problem with the amber extraction method is that DNA decays over time by exposure to air, water and radiation, making it unlikely that such an approach would recover any useful DNA (DNA decay can be measured by a racemization test). The successful extraction of ancient DNA from dinosaur fossils has been reported on two separate occasions, but upon further inspection and peer review, neither of these reports could be confirmed. However, a functional visual peptide of a (theoretical) dinosaur has been inferred using analytical phylogenetic reconstruction methods on gene sequences of still-living related species (reptiles and birds). One of the best examples of soft tissue impressions in a fossil dinosaur was discovered in Petraroia, Italy. The discovery was reported in 1998, and described the specimen of a small, very young coelurosaur, Scipionyx samniticus. The fossil includes portions of the intestines, colon, liver, muscles, and windpipe of this immature dinosaur. In the March 2005 issue of Science, Dr. Mary Higby Schweitzer and her team announced the discovery of flexible material resembling actual soft tissue inside a 68-million-year-old Tyrannosaurus rex leg bone from the Hell Creek Formation in Montana. After recovery, the tissue was rehydrated by the science team. When the fossilized bone was treated over several weeks to remove mineral content from the fossilized bone marrow cavity (a process called demineralization), Schweitzer found evidence of intact structures such as blood vessels, bone matrix, and connective tissue (bone fibers). Scrutiny under the microscope further revealed that the putative dinosaur soft tissue had retained fine structures (microstructures) even at the cellular level. The exact nature and composition of this material are not yet clear, although many news reports immediately linked it with the movie Jurassic Park. Interpretation of the artifact is ongoing, and the relative importance of Dr. Schweitzer's discovery is not yet clear. The sudden mass extinction of the non-avian dinosaurs, around 65 million years ago, is one of the most intriguing mysteries in paleontology. Many other groups of animals also became extinct at this time, including ammonites ( nautilus-like mollusks), mosasaurs, plesiosaurs, pterosaurs, herbivorous turtles and crocodiles, most birds, and many groups of mammals. The nature of the event that caused this mass extinction has been extensively studied since the 1970s. At present, several related theories are broadly supported by paleontologists. The asteroid collision theory, which was first proposed by Walter Alvarez in the late 1970s, links the extinction event at the end of the Cretaceous period to a bolide impact approximately 65.5 million years ago. Alvarez proposed that a sudden increase in iridium levels, recorded around the world in the period's rock stratum, was direct evidence of the impact. The bulk of the evidence now suggests that a 5-15 km wide bolide hit in the vicinity of the Yucatán Peninsula, creating the 170 km-wide Chicxulub Crater and triggering the mass extinction. Scientists are not certain whether dinosaurs were thriving or declining before the impact event. Some scientists propose that the meteorite caused a long and unnatural drop in Earth's atmospheric temperature, while others claim that it would have instead created an unusual heat wave. While similar to Alvarez's impact theory (which involved a single asteroid or comet), this theory proposes that a stream of comets was dislodged from the Oort cloud due to the gravitational disruption caused by a passing star. One or more of these objects then collided with the Earth at approximately the same time, causing the worldwide extinction. As with the impact of a single asteroid, the end result of this comet bombardment would have been a sudden drop in global temperatures, followed by a protracted cool period. At the peak of the dinosaur era, there were no polar ice caps, and sea levels are estimated to have been from 100 to 250 metres (330 to 820 feet) higher than they are today. The planet's temperature was also much more uniform, with only 25 degrees Celsius separating average polar temperatures from those at the equator. On average, atmospheric temperatures were also much warmer; the poles, for example, were 50 °C warmer than today. The atmosphere's composition during the dinosaur era was vastly different as well. Carbon dioxide levels were up to 12 times higher than today's levels, and oxygen formed 32 to 35% of the atmosphere, as compared to 21% today. However, by the late Cretaceous, the environment was changing dramatically. Volcanic activity was decreasing, which led to a cooling trend as levels of atmospheric carbon dioxide dropped. Oxygen levels in the atmosphere also started to fluctuate and would ultimately fall considerably. Some scientists hypothesize that climate change, combined with lower oxygen levels, might have led directly to the demise of many species. If the dinosaurs had respiratory systems similar to those commonly found in modern birds, it may have been particularly difficult for them to cope with reduced respiratory efficiency, given the enormous oxygen demands of their very large bodies. Dinosaur fossils have been known for millennia, although their true nature was not recognized. The Chinese, whose own word for dinosaur is konglong (恐龍, or "terrible dragon"), considered them to be dragon bones and documented them as such. For example, Hua Yang Guo Zhi, a book written by Zhang Qu during the Western Jin Dynasty, reported the discovery of dragon bones at Wucheng in Sichuan Province. In Europe, dinosaur fossils were generally believed to be the remains of giants and other creatures killed by the Great Flood. Megalosaurus was the first dinosaur to be formally described, in 1677, when part of a bone was recovered from a limestone quarry at Cornwell near Oxford, England. This bone fragment was identified correctly as the lower extremity of the femur of an animal larger than anything living in modern times. The second dinosaur species to be identified, Iguanodon, was discovered in 1822 by the English geologist Gideon Mantell, who recognized similarities between his fossils and the bones of modern iguanas. Two years later, the Rev William Buckland, a professor of geology at Oxford University, unearthed more fossilized bones of Megalosaurus and became the first person to describe dinosaurs in a scientific journal. The study of these "great fossil lizards" soon became of great interest to European and American scientists, and in 1842 the English paleontologist Richard Owen coined the term "dinosaur". He recognized that the remains that had been found so far, Iguanodon, Megalosaurus and Hylaeosaurus, shared a number of distinctive features, and so decided to present them as a distinct taxonomic group. With the backing of Prince Albert of Saxe-Coburg-Gotha, the husband of Queen Victoria, Owen established the Natural History Museum in South Kensington, London, to display the national collection of dinosaur fossils and other biological and geological exhibits. Othniel Charles Marsh, (19th century photograph). Edward Drinker Cope, (19th century photograph). Dinosaur mania was exemplified by the fierce rivalry between Edward Drinker Cope and Othniel Charles Marsh, both of whom raced to be the first to find new dinosaurs in what came to be known as the Bone Wars. The feud probably originated when Marsh publicly pointed out that Cope's reconstruction of an Elasmosaurus skeleton was flawed; Cope had inadvertently placed the plesiosaur's head at what should have been the animal's tail end. The fight between the two scientists lasted for over 30 years, ending in 1897 when Cope died after spending his entire fortune on the dinosaur hunt. Marsh won the contest primarily because he was better funded through a relationship with the US Geological Survey. Unfortunately, many valuable dinosaur specimens were damaged or destroyed due to the pair's rough methods; for example, their diggers often used dynamite to unearth bones (a method modern paleontologists would find appalling). Despite the pair's unrefined methods, their contributions to paleontology were vast; Marsh unearthed 86 new species of dinosaur and Cope discovered 56, for a total of 142 new species. Cope's collection is now at the American Museum of Natural History in New York, while Marsh's is on display at the Peabody Museum of Natural History at Yale University. Since 1897, the search for dinosaur fossils has extended to every continent, including Antarctica. The first Antarctic dinosaur to be discovered, the ankylosaurid Antarctopelta oliveroi, was found on Ross Island in 1986, although it was 1994 before an Antarctic species, the theropod Cryolophosaurus ellioti, was formally named and described in a scientific journal. 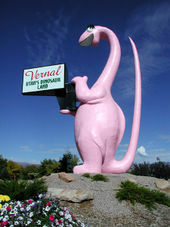 Pink dinosaur model at Vernal, Utah. By human standards, dinosaurs were creatures of fantastic appearance and often enormous size. As such, they have captured people's imagination and become an enduring part of human popular culture. 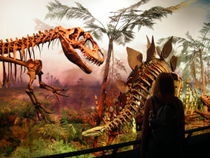 Dinosaur exhibitions, parks and museum exhibits around the world both cater to and reinforce the public's interest. The popular preoccupation with dinosaurs is also reflected in a broad array of fictional and non-fictional works. Various religious groups have views about dinosaurs that differ from those held by scientists. While many mainstream scientists respect these views as faith positions, they argue that religiously-inspired interpretations of dinosaurs do not withstand serious scientific scrutiny. See the referenced article for specific examples and further context.